It’s always a joyful storyline when an athlete comes back successfully from retirement—and I don’t mean the Brett Favre kind of retirement. I’m more referring to when an athlete has truly retired and steps away from the game, then comes back after a significant period of time. In the hockey world, we all recall Mario Lemieux making a courageous comeback from serious health concerns in the 1990s. Gary Roberts retired at a very young age with persistent neck issues. After time away he was again able to prepare himself for the high-risk physical demands of the game the way he played it. He went on to have a tremendous “post-retirement” second career—including time with the Leafs as an impact winger under Pat Quinn. One-time Hab superstar Guy Lafleur made a fairly successful comeback with the Rangers and the hated Quebec Nordiques, after he had felt pushed aside by Montreal management and coaches in the early 1980s. He was away from the game for almost four full seasons, but still managed to score more than 40 goals over parts of those three seasons before retiring for good at the age of 39. Maybe the most popular Maple Leaf (other than George Armstrong, who seemingly "retired" after every season near the end of his career and mostly just hated training camp, I think) to make a serious comeback from a premature retirement was winger Ron Ellis, who left the game in the mid-1970s, seemingly for good. Despite two years away from hockey, he came back to be the solid, reliable player he had always been. He played under the Roger Neilson regime and then on into the early 1980s. In more historical terms, the 1960s produced some of the most intriguing comebacks in hockey history. The guys that first come to mind are Dickie Moore (twice), Ted Lindsay and Bernie “Boom-Boom” Geoffrion. Two others were Doug Harvey and Jacques Plante. All are deserving Hall-of-Famers. Each story was quite different—and quite remarkable. The Lindsay situation was perhaps the most astounding. He had been a gritty, feisty and sometimes downright dirty winger for the Red Wings for more than a decade. He helped them win four Stanley Cups in the early 1950s, but by the late '50s he was too smart for his own good. He began to ask questions about how the game was being run by the owners and tried to establish an Association for the players, along with Montreal's All-Star defenseman, Doug Harvey. The insolence was too much for the league bosses to endure, and eventually every player who was publicly “outed” about their involvement in the effort to “unionize” (that was the perception, at least) was marginalized— and eventually traded. Most ended up in Chicago—the worst franchise in the league at the time. Lindsay was one of those dumped into hockey's weakest market. He worked dilligently for the Hawks for three seasons and played a key role in helping change the attitude in the Chicago dressing room. He retired after the 1959-’60 season and his former teammates went on to win the Stanley Cup the very next season behind the goaltending of Glenn Hall, several solid role-players and the exploits of stars like Pierre Pilote, Stan Mikita, "Moose" Vasko, Bobby Hull and ex-Leaf Tod Sloan. Lindsay went into business full-time and did some broadcasting as well. He kept in shape by practicing on occasion with the Red Wings. Then, before the 1964-‘65 season, at the age of 39, he decided he wanted to play again. Amazingly, he scored 14 goals that season and three more, I think it was, in the playoff series against the Black Hawks. Despite his success, he retired again, and didn’t re-surface in hockey until he became GM of the Wings in 1978. For his part, Moore was a hockey warrior for the Montreal Canadiens for some ten years. A true All-Star winger, he was a scoring champion and won six Cups with the Habs. But after the 1962-’63 season, he was targeted by management as being “over the hill”. That same summer, he suffered a serious knee problem as a result of an industrial accident. He retired, but a year later, despite bad knees, came back when he was “drafted” by Punch Imlach and the Maple Leafs, who convinced him to join the blue and white. Moore worked his tail off to get back into game shape, but struggled to keep up most of that season with younger, healthier teammates. He did play hard and well at times, and scored a goal in the playoffs against the team that cast him adrift (Montreal) in a great 6-game semi-final series. The Leafs did not guarantee him a spot the next season, so he quietly retired again. However, Moore re-surfaced yet again a few years later, when Scotty Bowman was running the expansion Blues. He joined the team for the end of the 1967-’68 season and played brilliantly in the playoffs— helping lead the first-year Blues to the finals against Montreal. He scored 14 points in 18 playoff games on injury-riddled legs that spring, at the age of 37. 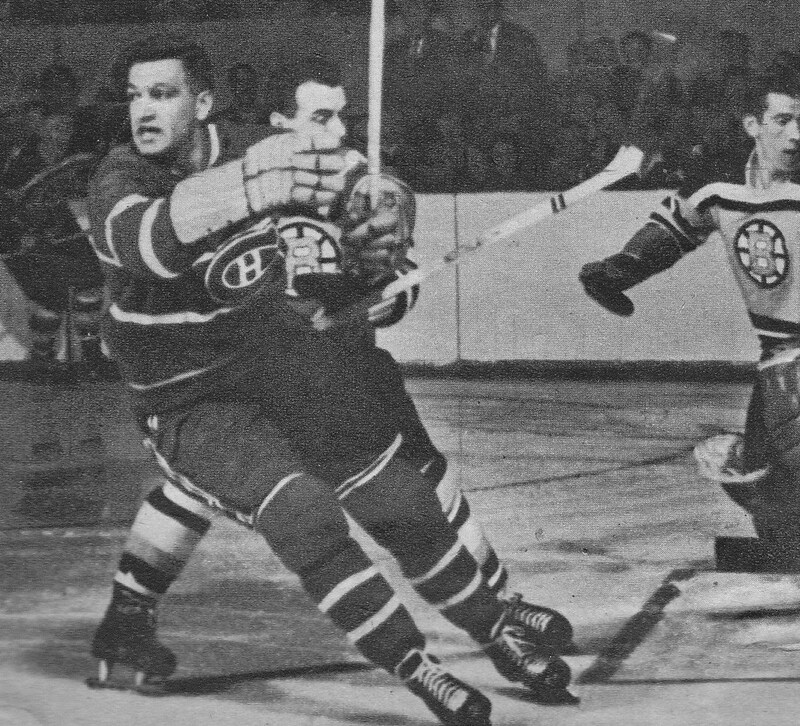 Geoffrion, pictured at the top of this story scoring against the Bruins and Don Simmons in the late 1950s (who went on to help the Leafs win the Cup in 1962), was another who probably felt pushed out in Montreal, like Moore before him and Lafleur years later. Geoffrion was a hard-as-nails forward who became the first player since “Rocket” Richard to score 50 goals in one season (1960-’61). 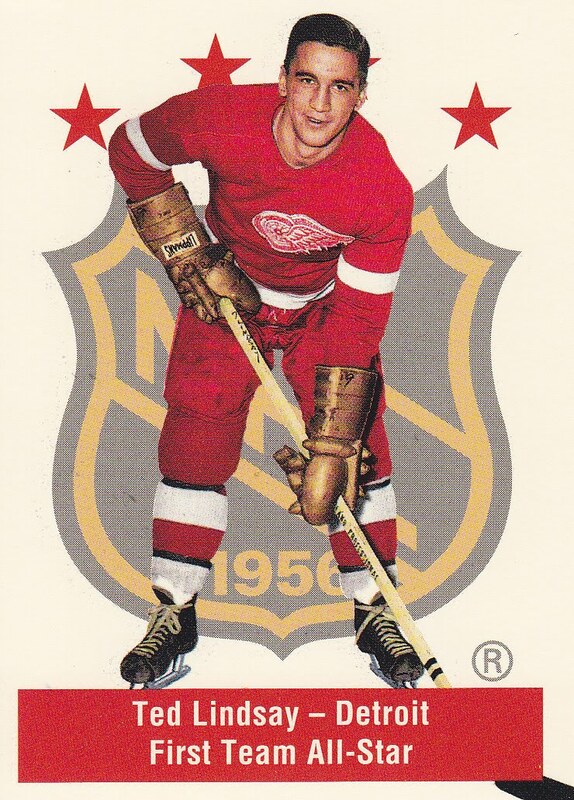 He was a huge part of those five Cups in a row in the late ‘50s, but had slowed down by the early ‘60s. He retired after the 1963-‘64 season, and for a time coached the Quebec Aces of the American Hockey League. But, after two years off the ice, he mounted a comeback with the New York Rangers, under General Manager Emile Francis. During that 1966-’67 season, he helped lead the Rangers somewhere they hadn’t been in years— the playoffs. They lost to his old team, Montreal, but I remember him scoring a great goal in the playoffs against them. He retired again after the 1967-’68 season and became the coach of the Rangers, until health issues cropped up. He later coached the expansion Atlanta Flames, and became one of the most beloved sports figures in that market, though hockey was hardly a major sport down south at the time. Doug Harvey, in his era, was simply the best defenseman in hockey. 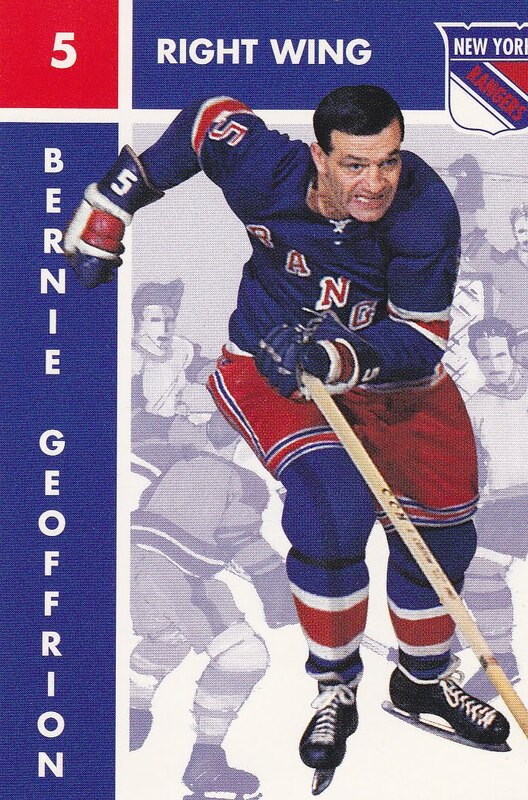 He was a player-coach in New York after he was traded by Montreal to the Rangers in 1961, but his game went downhill quickly after a great first season in New York. He had some off-ice issues and played primarily in the minors through much of the ‘60s. But amazingly, he joined the St. Louis Blues during the 1967-’68 playoffs (he had been in the minors that season) and the next season as well. While very slow at this point in his career, he was still largely effective. He had always been credited with being able to “play defense in a rocking chair” and that’s pretty much what he did in his time with St. Louis. He was probably still the smartest guy on the ice. He retired after the 1968-'69 NHL season. He was overweight and 44, yet finished that season a +11 in terms of his plus/minus. Plante I’ve written about recently, but for those who missed those posts, he retired after a great career with Montreal and the Rangers. He was fully away from the game for almost three seasons, before coming back to join Glenn Hall and the expansion Blues for two seasons in beginning in 1968-'69. He was outstanding with St. Louis, where he played with his old pal Harvey for a season, then moved to Toronto where he excelled for the better part of three seasons, before finishing his NHL career at the age of 45 with the Bruins. To do what Plante did was astounding. It’s like he had two separate and distinct careers—both brilliant. There have always been, and will always be, great comebacks in hockey And they will always be, for me, some of the best stories of all. By all means, if you have fond memories of hockey comebacks, send your recollections along!